Super Art Fight returns for the 2019 edition of the coolest pop-culture convention in Washington, DC, Awesome Con! And we’ll be tabling in the Artist’s Alley all weekend long! Baltimore! It’s time to get up close and personal with the Greatest Live Art Competition in the Known Universe as they return to the Ottobar for another ridiculous night of Art Fight action! 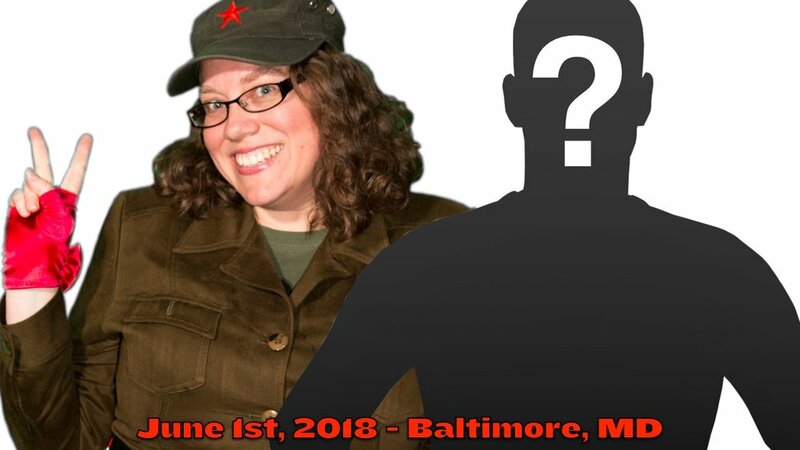 Artists become rockstars in this over the top battle royale, equal parts pro-wrestling and Pictionary, as creative combat collides live in Charm City! Two artists, a giant canvas, and unlimited laughs - join the fun and see it live! 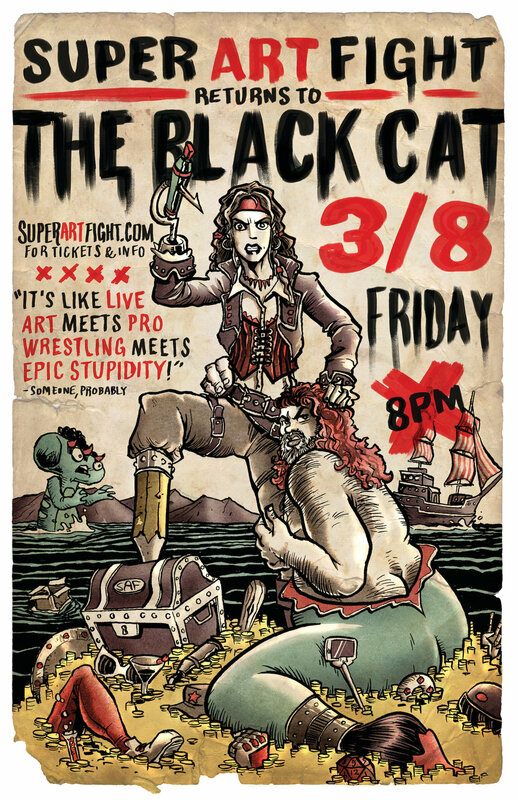 Super Art Fight returns to Washington, DC for a night of over-the-top, ridiculous art fights at the legendary Black Cat. 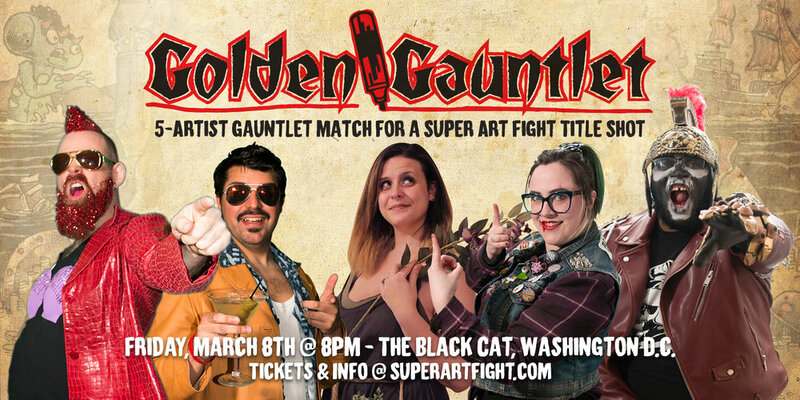 Five artists collide in the GOLDEN GAUNTLET, where the winner earns the Super Art Fight Golden Opportunity Marker, giving them a future SAF title shot – any time, any where! All five artists will be introduced at the top of the show. Two artists will be picked at random, live at the show. They will have a match - the winner stays on. Artist #3 will be picked at random for match #2. This will continue until ONLY ONE ARTIST is left standing! WHO WILL BE ABLE TO RUN THE GAUNTLET?! Find out LIVE! Super Art Fight Returns to MAGFest for an Amazing Weekend of Shows! Join Super Art Fight as we play our cool new card game Cute Animals On Fire! Selected audience members will get to PLAY THE GAME LIVE WITH US. No pressure or nothin’. Super Art Fight’s 2019 Season kicks off with the first ever TAG TEAM GAUNTLET. Teams announced below. 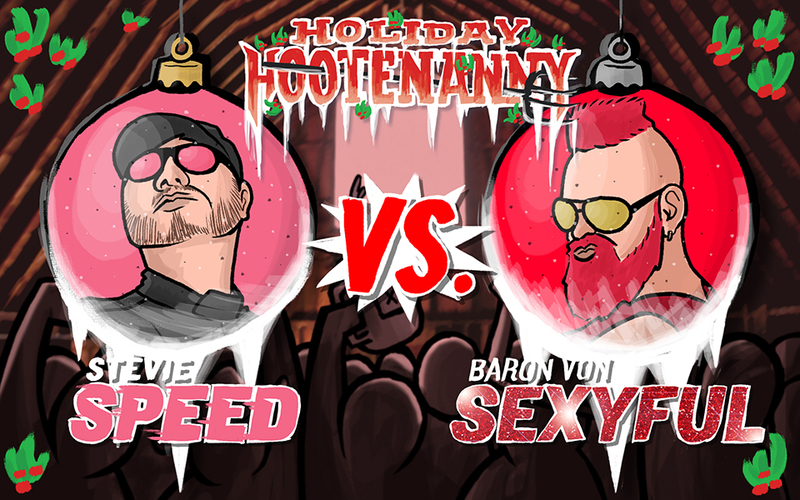 Forget the Nutcracker, screw a Christmas Pageant, and say bye-bye to a solemn Chanukah celebration - it’s time to embrace the holidays with Super Art Fight! Super Art Fight joins the 2018 edition of Anime USA! Super Art Fight heads to NYC for NYCC’s Anime Fest! Super Art Fight heads north to London, Ontario, Canada for the 2018 edition of Forest City Comic Con! Super Art Fight returns for the 2018 Edition of Otakon, in Washington DC. Four Artists Collide, in a single elimination tournament! No holds are barred in this insane, dark, offensive, and absolutely UNLEASHED Super Art Fight event! Set your eyes to STUNNED. 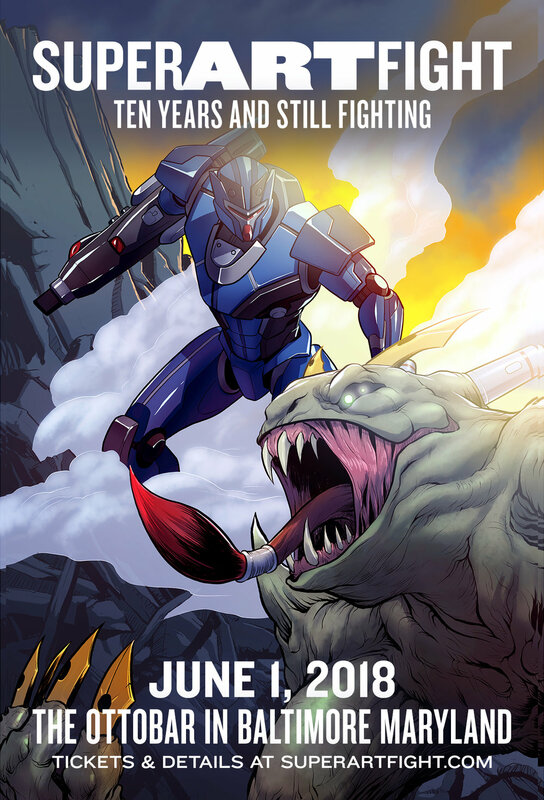 Super Art Fight goes family-friendly for all-ages at BCPL's Catonsville Branch Comic Con! THIS SHOW IS FREE TO ATTEND. Super Art Fight is in action at 1pm! SAF returns home to Baltimore's Ottobar to celebrate a decade of dominance. Super Art Fight returns for the 2018 edition of ESCAPE VELOCITY. Use offer code 'SUPER20' to get 20% off! Super Art Fight returns for a free, family friendly event as a part of Anne Arundel County Public Library Comic Con! Bring the whole fam out, and watch as we do our best to watch our language and keep the art clean! Bouts at 10:15am and 11am! SAF returns to Washington DC's Union Stage for an event which can only be described as pure CINCO DE MAYHEM! For the first time ever, Super Art Fight heads to Boston for PAX EAST. 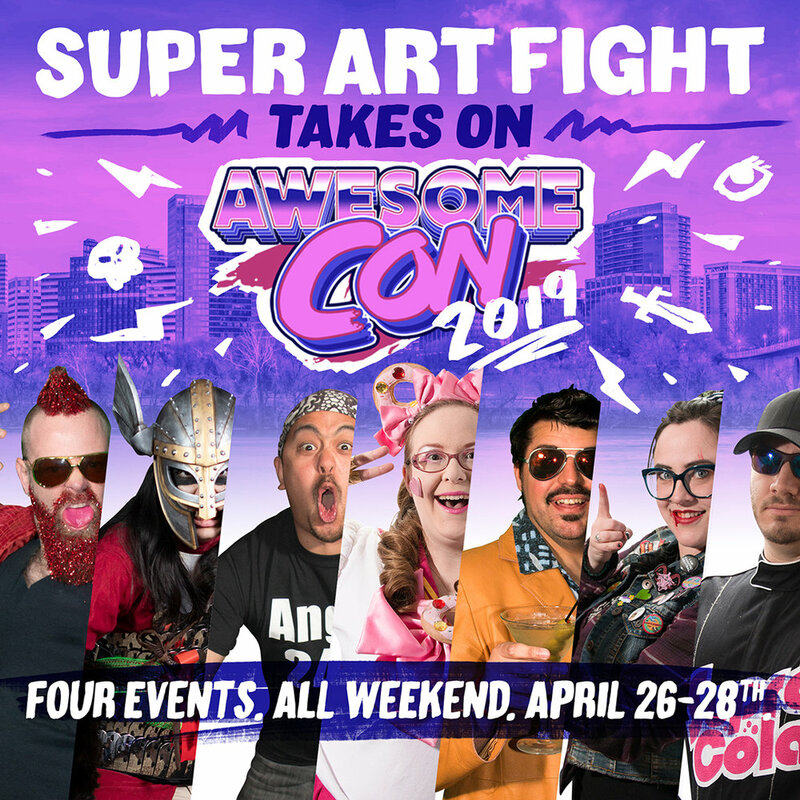 Super Art Fight returns for the 2018 edition of AWESOME CON. Super Art Fight: The Home Game! The Greatest Live Art Competition in the Known Universe is ready to launch its first ever card game, CUTE ANIMALS ON FIRE, and we're bringing a prototype deck to Fantom Comics to play-test with our friends, fans, and any random people who want to give it a go!